Western Africa is the 5 million square mile area located in the westernmost region of the African continent. It is considered a geographic entity based on shared cultural and linguistic traits throughout the region. In the centuries just prior to the twentieth, Western Africa was victim to both the slave trade and colonialism. Sadly, slavery has been a part of human civilization for thousands of years, and is a scar on the face of human history. Many of the nations within the region suffer from extreme poverty and nearly non-existent medical care, allowing for preponderance of low life expectancy, tropical diseases and the HIV/AIDS epidemic. In many cases this is due to corruption of power and wealth on the part of the nations' leaders. The inhabitants of West Africa have been linked throughout history through a dense system of trade routes that have existed in the area since ancient times. While the intricate system of trade routes served to unify the area based on economics, the area also developed a distinct cultural identity based on linguistic similarities. The language variations found throughout the region can be traced to either the West Atlantic or Mande language family, a fact which solidified cultural ties throughout the region. Spanning over 5 million square miles, West Africa is bordered in the west and south by the Atlantic Ocean, in the north by the Sahara Desert, and in the east by the 10° longitude line. The borders of West Africa have always been contentious, particularly when it comes to defining the northern border of the territory. Due to the mutable borders of the Sahara, West Africa must be defined more through its cultural identity than perpetually changing artificial boundaries. In the same vein, the eastern border of West Africa has proven controversial, with many scholars disagreeing as to whether to place the dividing line at Benue Trough or at the line running from Mount Cameroon to Lake Chad. Western Africa is underlain by crystalline rocks that outcrop over about 55 percent of the subcontinent. Where these do not outcrop, they are being buried under sedimentary rocks. Other surface rocks consist of volcanic rock which covers a smaller area than the other two types. Western Africa lies below 5,000 feet, with most of the region lying below 1,500 feet. The wide low–lying plains are punctuated by isolated high points along the southern shore that exist in numerous countries. Isolated high plateaus and mountains are found in Cameroon, Côte d'Ivoire, Guinea, Liberia, Nigeria, Sierra Leone, and Togo. Smaller hills and ridges abound, especially on the crystalline craton rocks. The low lying terrain in the north is defined as the Sahel, a semi-arid landscape that separates the Sahara from the savanna woodlands in the Western Sudan. Rainforests form a third geographic zone, lying between the savannahs and the southern coast and ranging from 160 km to 240 km in width. The Niger River is the major river, which rises about 300 miles from the Atlantic coast in Guinea and flows initially northeast toward the Sahara. It turns south and southeast and flows through Niger and Nigeria. Other large river systems include the Senegal, Volta, and Benue. Many short rivers flow to the Atlantic, while the Chad Basin catches the inland rivers. Western Africa lies within the tropics, sandwiched between the Sahara to the north and the equatorial Atlantic to the south. This allows for a broad difference in climate of the various areas, from very hot and dry in the north to hot, wet, and humid in the south. Two air masses dominate the climate, one located over the Sahara which brings hot dusty northeast trade winds while the other, generally over the tropical Atlantic area brings cloud cover, heavy rainfall, and high humidity. Due to these two air masses and the convergence zone between, Western Africa weather consists of five north–south zones which bring a variance in temperature, humidity and precipitation. Most countries in the region, due to the near extinction of its once abundant species, such as antelopes, buffaloes, cheetahs, crocodiles, elephants, gazelles, giraffes, leopards, lions, oryx, and rhinoceroses, have conservation policies. Within a number of the nations are national wildlife and game parks in which these animals can be observed. The wild dogs, hyenas, and jackals that fed upon the larger game have also largely disappeared. Large flocks and herds of sheep, goats, and cattle exist, primarily in the savannas. Smaller species such as baboons, chimpanzees, monkeys, hogs, wildcats, iguanas, lizards, and snakes have also been able to survive. Prehistory, which is commonly defined as the time when the first human settlers arrived, began in West Africa around 12,000 B.C.E. The first settlers are thought to be the Pygmies, who began settling in the region in the thirteenth century B.C.E. They began developing different forms of agriculture and making contact with the Mediterranean civilizations to the north. Sedentary farming began around the fifth millennium B.C.E., and was coupled with domestication of cattle. By 400 B.C.E., iron working technology allowed an expansion of agricultural productivity, and as a consequence the first city-states formed. Development of city-states was aided by the domestication of camels, a fact that allowed West Africa to take its place in the cross-Saharan trade. By utilizing the unique ability of the camel to cross the Sahara, West Africa was able to make contact with Carthage in the north and the Berber people of the Sahara. Major exports from West Africa included gold, cotton cloth, metal ornaments, and leather goods, which were then exchanged for salt, horses, and textiles. Beginning with the eighth century, agricultural and economic advances combined to create an environment favorable to political expansion. The first empire to develop was the Kingdom of Ghana, which was based in the city of Kumbi Saleh and came to dominate the region until the middle of the eleventh century. The power vacuum following their decline was filled by the Sosso Empire, but it met defeat in 1240 C.E. at the hands of the Mandinka forces led by Sundiata Keita. Keita would later form the Mali Empire and subdue the bulk of West Africa under his political authority. The Mali Empire continued to flourish for several centuries (most particularly under Sundiata's grandnephew), Kankan Musa I before a succession of weak rulers led to its collapse. The next hegemonic power to emerge in West Africa was the Songhai Empire in the fifteenth century. This empire was based in Gao and established itself as the main power in the region. Militarism also took hold of West Africa with the rise of the Songhai empire, and strong militaristic states also arose in Ife, Bono, and Benin around the fourteenth and fifteenth centuries. Further east, the Oyo Empire arose as the dominant Yoruba state and the Aro Confederacy as a dominant Igbo state in modern-day Nigeria. The fall of the Songhai Empire in the late sixteenth century ushered in an era of smaller West African states that drew on European trading contacts to survive. A major trading power among the newly emerged West African states was Portugal, who began establishing settlements along the coast in 1445 C.E. Other major European trading interests included France and Great Britain, who played major roles in dramatically increasing the exports of slaves from the region. The trans-Atlantic slave trade produced states such as the Bambara Empire and Dahomey, whose economies largely depended on providing slaves for the European traders in exchange for firearms and other valuable goods. In the nineteenth century, European and American governments outlawed the Atlantic slave trade and made it illegal to import slaves from Africa. The last country to outlaw the importation of African slaves was Brazil, who made the slave trade illegal in 1888. The nineteenth century saw a dramatically changed political structure in Western Africa through a series of internal reform movements as well as the intervention of European forces. In the early 1880s Fulani reformist jihads swept across the Western Sudan. While arguing for dramatic social and legislative reform the Fulani jihads succeeded in replacing the existing Hausa city states. Other significant jihads were led by Seku Amadu against the Bambara, and El Hadj Umar Tall's campaign with the Toucouleur Empire, a military advance that briefly conquered much of modern-day Mali. While facing internal threats, West Africa also became a battle ground for French and British forces. In an attempt to gain more territory under colonialism, the French and British continued to advance in the Scramble for Africa, subjugating kingdom after kingdom. While attempts were made to resist the colonialism, West African military resistance came to an end with the fall of Samory Toure's new-founded Wassoulou Empire in 1898 and the Ashanti queen Yaa Asantewaa in 1902. After West Africa was claimed by colonial powers, Britain emerged as the giant controlling The Gambia, Sierra Leone, Ghana, and Nigeria throughout the colonial era. France also controlled extensive territory and unified Senegal, Guinea, Mali, Burkina Faso, Benin, Côte d'Ivoire, and Niger into French West Africa. Smaller players in African colonialism, Portugal founded the colony of Guinea-Bissau, while Germany claimed Togo, but was forced to divide it between France and Britain following the First World War. Only Liberia retained its independence, but did so at the price of major territorial concessions. Following World War II, nationalist movements arose across West Africa and many countries fought for independence from colonial rule. The first colony in West Africa to gain independence was Ghana, who did so under the leadership of Kwame Nkrumah in 1957. The independence of Ghana began a movement throughout West Africa, and was followed the next year by France's colonies. The nationalistic movement culminated in 1974, when West Africa's nations were considered entirely autonomous. Independence has proven problematic to many West African nations, particularly Nigeria, Sierra Leone, Liberia, and Côte d'Ivoire, who have been plagued with political corruption and instability. Also contributing to instability in the region, the AIDS epidemic is a growing problem, particularly in Côte d'Ivoire, Liberia, and Nigeria. In addition, famine has been a problem in parts of northern Mali and Niger, the latter of which is currently undergoing a food crisis. Despite the wide variety of cultures in West Africa, from Nigeria through Senegal, there are apparent similarities in dress, cuisine, musical genres and wealth. Many of the visual similarities lie along the lines of clothing, especially formal clothing. A typical formal attire commonly worn in West Africa is the flowing Boubou (also known as Agbada and Babariga), which has its origins in the clothing of nobility of various West African Empires of the twelfth century. Throughout Western Africa, many recreational activities are shared throughout the many cultures and ethnic identities that exist in the region. Like many parts of the world, soccer is extremely popular in West Africa and the national teams of some West African nations, especially Nigeria, regularly qualify for the World Cup. The game Oware, called Mancala in other parts of the world, is also quite popular in many parts of the region. West Africa also exhibits a surprisingly unified musical culture, when the sheer size of the area is considered. In contemporary West Africa Mbalax, Highlife, Fuji, and Afrobeat are all popular musical genres. Traditionally, the Djembe drum was popularly played among many West African ethnic groups. The origins of the drum dates back to the Mandinka peoples, and the historical importance of the drum has cemented its position as a symbol of the entire West African region. Other symbols of the region include the highly intricate woven Kente cloth of the Akan peoples of Ghana and the distinct Sudano-Sahelian architectural style seen in the many mosques of the region. Most religions in West Africa feature a prominent supreme deity understood to be reached through subordinate spiritual powers. While this basic idea took root throughout West Africa, many religious variations formed among individual cultures. For example, some religions that emerged established different overreaching views on morality to govern everyday life. Modern permutations of traditional West African religions are found in the proliferation of Islam throughout the region. As the second most prominent religion in West Africa, Christianity has taken hold in the coastal regions Nigeria, Ghana, and Cote d'Ivoire. However, elements of indigenous religions are still practiced throughout the entire West African region. Judaism, while though boasting a much smaller population, has also existed in the region dating back to the heyday of the Mali and Songhai Empires. Jewish communities continue to be active in Ghana, Nigeria, and Mali. The Economic Community of West African States (ECOWAS) was founded in 1975 by the Treaty of Lagos. It is an organization of West African states that aims to promote the region's economy. 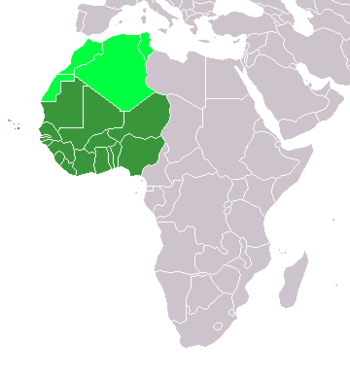 Other West African conglomerations also exist throughout the region, including the West African Monetary Union (or UEMOA from its name in French, Union économique et monétaire ouest-africaine). However membership to the West African Monetary Union is limited to the eight, mostly Francophone countries that employ the CFA franc as their common currency. Another organization existing in the region, the Liptako-Gourma Authority of Mali, Niger, and Burkina Faso seeks to jointly develop the contiguous areas of the three countries. ↑ The Maghreb, an Arabic word meaning "western," is a region in northwestern Africa comprised of Morocco (including Western Sahara), Algeria, Tunisia, and (sometimes) Libya (see Northern Africa). Davidson, Basil. 1969. Africa in history; themes and outlines. New York: Macmillan. Encyclopædia Britannica. Western Africa. Retrieved July 25, 2007. West Africa by Region and Country – African Studies. This page was last modified on 8 August 2013, at 14:05.